THE TERM ‘E-waste’ is not new but it is still not common. Commoners are unaware to this term. E-waste is the waste regarding all electrical and electronic equipments that include computers, mobiles, television sets, refrigerators, ovens, toasters and home entertainment like electric games, stereo system, toys etc. The reason behind the increase E-waste is the rapid development and number of electronic equipments. Modern technology is coming day by day. In this way people try to have modern and latest equipments available in market. Increasing demand for modern technology is making the electronic companies clever and richer. They introduce the modern technology step by step and in a series. Then innocent people also purchase modern and latest things. The question is that why don’t these companies introduce a complete package after reviewing all aspects in their new and latest technology? Cell phones are the common example to support this point of view. We see a latest model of same cell phone everyday in the market. And people look crazy to have it. E-waste is the big problem for developed as well as underdeveloped countries. But developed states have solved this problem to some extent as they usually export their e-waste to underdeveloped countries like India, Pakistan, Bangladesh and many other African countries. Actually more than 50 elements from the periodic table assemble typical electrical or electronic equipment e.g. a personal computer. Besides many hazardous metals some of the precious metals also exist in the electronic equipments like copper, silver and gold. A cell phone contains around 40 elements from the periodic table in which the base metal is copper, others are indium and antimony and precious metals like silver, gold and platinum. The precious metals exist in a small amount (milligrams) i.e. 250 mg silver, upto 24 mg gold and 9 mg platinum. 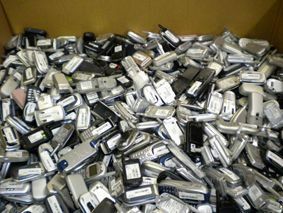 These amounts seem very little but if there is bulk amount of cell phones then the extracted amount of precious metals are also very large. Due to these precious metals importance of e-waste cannot be neglected. People extract these metals from the electronic equipment using a lot of techniques. And in extracting the valuable metals people ignore the dangerous effects of the hazardous metals. In monitors and television sets a CRT (Cathode Ray Tube) is present which incorporates many useful metals within toxic substances. Among these toxic substances one of the most toxic elements is cadmium. It also exists in rechargeable laptops batteries. Cadmium has a large number of toxic effects on human health. Human respiratory system may be damage by the inhalation of cadmium contaminated air. Its affects have also been observed in kidney damage, reproductive system, bone damage etc. It is also observed that cadmium can cause cancer. Mercury is another toxic element used in lighting devices in flat screen displays. Mercury is a heavy metal and its toxic effects are greater on human health. Even the fumes of mercury can damage seriously the human internal structure. It can damage the nervous system, brain and kidneys. Lead is another important and toxic element in the electrical devices. Lead takes part an important role in the metal production processing. Even the lead-free components are co-produced with lead. If lead is inhaled by humans, mainly through breathing and feeding, it is not metabolized, but commonly expelled. The remaining portion (about 20 per cent) settles into the tissues, blood, mineral (teeth and bones) and soft tissues. Due to the complex composition of hazardous and precious substances in the electronic devices specialized methods are required in such a way that they not only save the precious substances but also defuse the waste substances with less harmful effects on human body as well as on environment. But unfortunately the high tech methods are very costly. That’s why the e-waste is exported to under-developed countries. Pakistan is also a big market for e-waste. The government should take serious action against this problem. Electronic companies should also take part in it. They should launch their products in the markets after a complete review and experiments. The only solution of the E-waste is that it transferred to the other planet. It seems ridiculous but we will have to take this step if we do not pay serious attention to this problem. cadmium contaminated air. Its affects have also been observed in kidney damage, reproductive system, bone damage etc. It is also observed that cadmium can cause cancer.